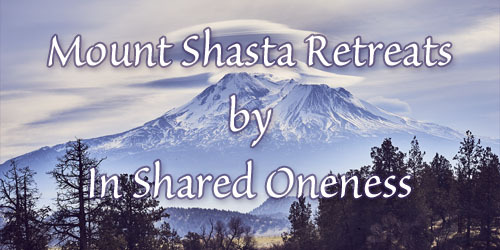 In Shared Oneness retreats are held in Mount Shasta, a spirtual destination site and vortex known for its high vibrations and natural beauty. The shape of our retreats is fluid, responding to the Now, tailored to the participants using a variety of offerings to allow shifts of consciousness. Our retreats are adapted to the seasons, with the winter time being especially conducive for introspection. We offer customized retreats for individuals, couples, families and groups; by request. We regularly organize public retreats. We welcome inquiries for general spiritual retreats. Our multi-day retreats provide a real opportunity to go into a deep immersion for a profound transformation of Being, with ample opportunity to release what is ineffective in your behavior and life. We have found that this type of immersion truly helps make the deep long lasting changes that people are looking for. We focus on helping you realize yourself as the Unique Expression of the Divine that you are here to be and demonstrate, while giving you the tools to implement your Soul’s expression. Our retreats supply the breadth and depth of work necessary for you to realize your wholeness, along with empowering you to continue your inner journey on your own. Opening to your Real Self is a very freeing and elevated experience. Living from this empowered state of your Unique Being is life changing. The liberation is profound. If you are open to an immersive, transformative experience we would love to be a part of you coming home to yourself and your life’s highest expression. To discuss and request a private customized retreat, please contact Angelique at 415-706-9320. Angelique, Mary and Edward bring together decades of experience and a variety of perspectives and offerings to help you uncover what causes disconnection from your True Self by examining mis-perceptions and mis-creations that fuel a life lived from fear rather than from the center of your Soul's knowing. We are in this life to live our unique, unobstructed, Creative Self Expression. Our visions, gifts, talents, intelligence and capacities are meant to be fully actualized. We are meant to be our Noble Self in comfortable harmony with All, and rest in the peace of mind, heart and being as we walk our path of Conscious Enlightened Presence. If we are not living in unencumbered joyful and happy participation with this Infinite Source, we are living a dulled version of our True Nature. What we hold in human consciousness, we live! What we attune to as Divine consciousness, lives us! Divine Consciousness as Our Very Being! "Know and realize the world is within, and allow action born of vision and love. Now is the time."